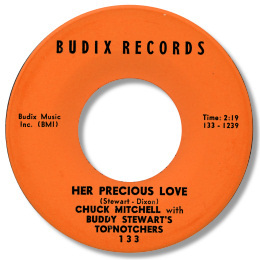 Chuck Mitchell – whose real name was Mitchell Johnus Geran – was a celebrated local performer on the Pelican State music scene for many years, fronting bands for such stars as Raful Neal, Slim Harpo and, latterly, Robert Milburn and the Bluenotes. He was inducted into the Louisiana Blues Hall Of Fame for his enduring contribution to the music but sadly passed away in January 2003. Despite his long career, his recorded legacy is very small indeed – just the 2 45s. 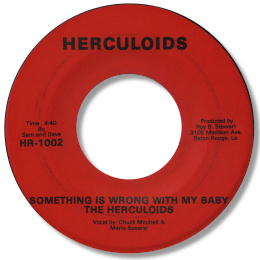 As part of the Herculoids with Merle Spears, he cut arguably the best cover of “When Something Is Wrong With My Baby”, and as a solo artist just this interesting effort. Set in the double time 12/8 Her Precious Love is a bluesy ballad with full band support based loosely on “For Your Precious Love”. There’s no information on this disc, of course, but it can’t have been recorded after the mid 60s from its style and presentation, and Mitchell does it justice with his high, confident baritone voice and occasional near falsetto bursts. I like the bouncy flip with it's pronounced New Orleans R & B feel as well. This isn’t an easy 45 to find but that shouldn’t stop anyone looking. UPDATE ~ Greg Burgess reports the sad news that Chuck Mitchell passed away in 2003.